Yesterday on Knitting Daily they featured a video on the Tubular Cast-On with knitting expert Eunny Jang. I love that Knitting Daily produces these videos for knitters to try new techniques. However, I thought Ms. Jang should have made a better waste yarn choice to show less experienced knitters the technique. First it is best to choose an easily removed yarn. A waste yarn should just be able to be snipped at the end stitch and the other end pulled to un-zip the knitting. 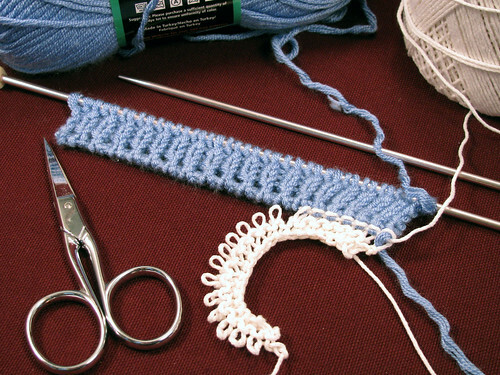 A smooth yarn such as a crochet cotton or other smooth fiber is best. I also use nylon on occasion if the yarn is really catching like a mohair. Second a contrast color that is easy to see and never darker than the main yarn should be chosen. The problem I see with her choice is that the darker fibers can get caught in stitches giving the finished hem a dirty looking line. So when working with white main yarn choose a light contrast and something that won’t leave fibers behind. These are just a couple of observations. On my sample I knit the waste yarn in garter stitch so it wouldn’t roll up. Another note if knitting with crochet cotton feels stiff, only the row right before the main yarn begins needs to be in the easy to remove yarn. I usually only knit this one row when using any kind of nylon thread. Meaning I start with an easy to knit contrast yarn and switch to the nylon for the last row before the main yarn. I posted a second photo on my flickr page showing the stitch to clip. It isn’t that I want to find fault with the video, though this post to me seems that I do. I have had to pick fibers from and edge with tweezers and still didn’t get them all out, and second it is so much fun to see the two pieces of knitting zip apart when the ball end of the waste yarn is pulled. A provisional cast-on in waste yarn can be used too, except you don’t get to do any un-zipping. This entry was posted on Thursday, November 20th, 2008 at 3:00 am and is filed under Knitting. Tagged: Knitting. You can feed this entry. You can leave a response, or trackback from your own site.